OMG Suzie!!! This is a great idea!!! 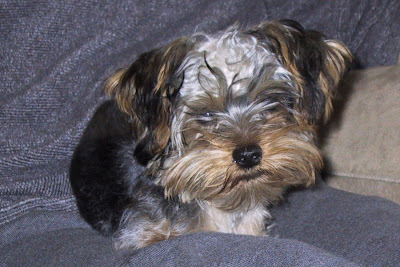 I have a 9 month old Yorkie Poo and she just destroys anything stuffed...I am going to make a few of these and stuff with her dog food...I am sure she will LOVE THEM! I'm always trying to make ways for him to have to work for treats, but the cardboard boxes that I've been putting them in, are now torn apart in 5 seconds :P And he's only an 18 pound, bichon/poodle mix. These are great little items to keep any pet playful. 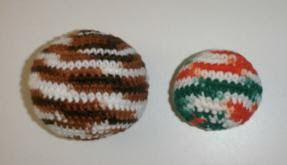 I have crocheted balls for cats and added some cat nip inside and a bell on the outside. My dog is a minuture austrailian Shepard and will destroy ANYTHING in her path!! ( ex- ac unit wires ). I just made a doggie kong for her and she loves it- I can tell! Plus it sooo very easy to make. Thanks for the wonderful pattern! Just made this for my little yorkie and he loves it. Got the treats out quick though. Thanks!